The Spanish first found the Keys during Ponce de Leon's expedition in 1513. They mapped and named the Keys principally as an aid to their ships, which, full of gold and silver, used the Florida Straits to go from the New World back to the Old. The first settlement was at Key West, in 1882, a little more than two decades before Florida became a state. The other Keys pretty much stayed deserted until 1874, when the government surveyed them. After the survey, the government plotted land for businesses and homes. The early homes were primitive. They were built from the local beaches, made of wood and other materials washed up from shipwrecks. In 1912 Henry Flagler built a railroad to Key West. This greatly increased human settlement of the Keys. The railroad was destroyed by a hurricane in 1935, but in 1938 the longest over-water road in the world was built on the railroad's foundation. It includes 42 bridges--one that is seven miles long! 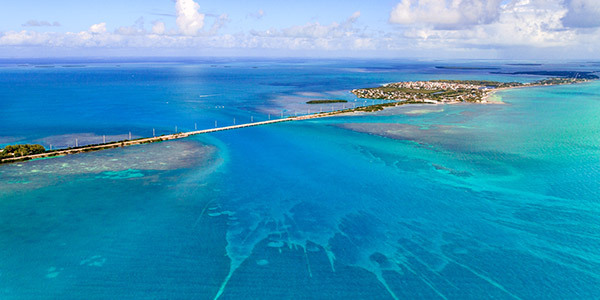 This opened the Florida Keys up to a growing tourist trade.